Holiday Hellboy is a handmade, high quality resin gaming piece based around an iconic piece of festive Hellboy artwork drawn by Mike Mignola. This amazing celebratory piece will only be available to order until December 31st, 2018. 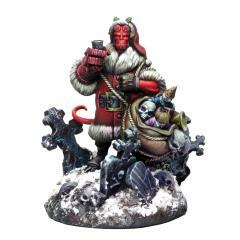 Holiday Hellboy comes unpainted and requires assembly, but will most definitely make a fantastic festive-themed gift for any Hellboy fan. The set also comes with an exclusive numbered B.P.R.D. Agent card/certificate so you can use the piece in Hellboy: The Board Game.